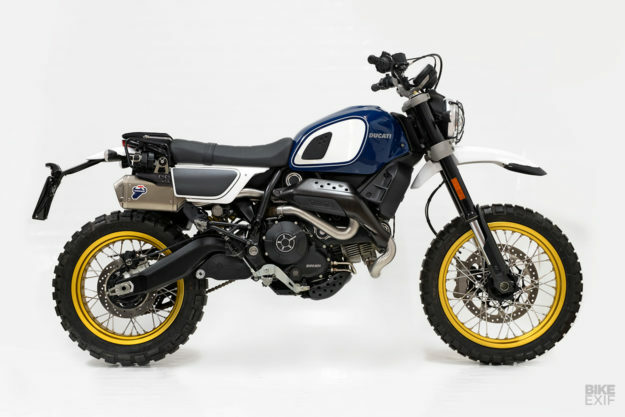 If there’s a spiritual heir to the go-anywhere machines of the 1960s, it’s the Scrambler Ducati Desert Sled. Unlike most modern-day scramblers, the Duc is happy in the rough stuff. Even if it’s unlikely to be thrashed as much as the 1963 Bonneville that Bud Ekins built for Steve McQueen. 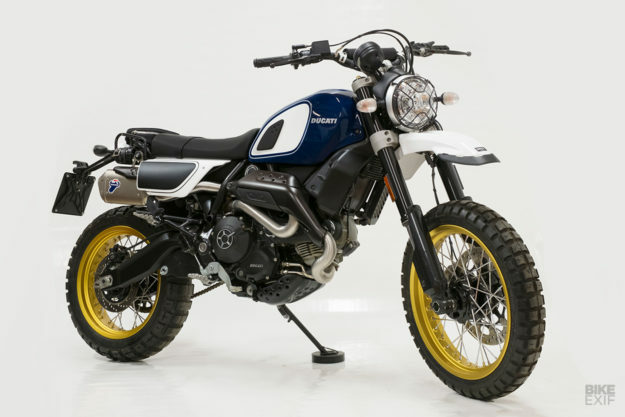 When our man Matt rode the Desert Sled a year ago at the launch in Spain, he was impressed: “The Desert Sled is the scrambliest scrambler money can buy,” he said. But of course, some people will always want to push things further—and one of those folks is former Paris-Dakar Rally racer Fabio Marcaccini. Fabio now runs Unit Garage from his base in a small town near the Adriatic coast, on the eastern seaboard of Italy. He makes kits that amp up the offroad performance of modern-day BMWs, Triumphs and Moto Guzzis. And he doesn’t sell farkles—he raced the Dakar five years in a row for Yamaha, so he knows what works and what doesn’t. 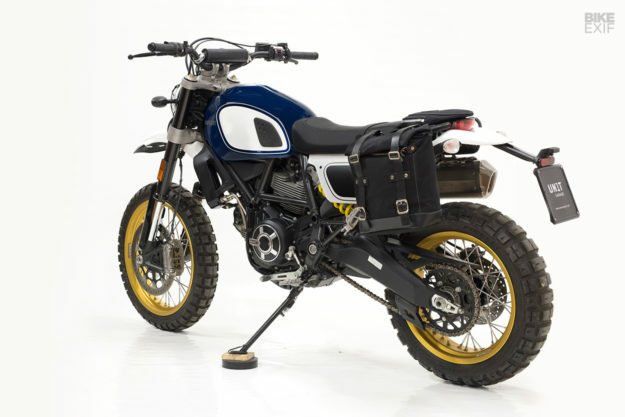 This prototype machine is called Fuoriluogo, which loosely translates to ‘outsider’ or ‘out of place,’ and Ducati supplied a Desert Sled to kick the project off. 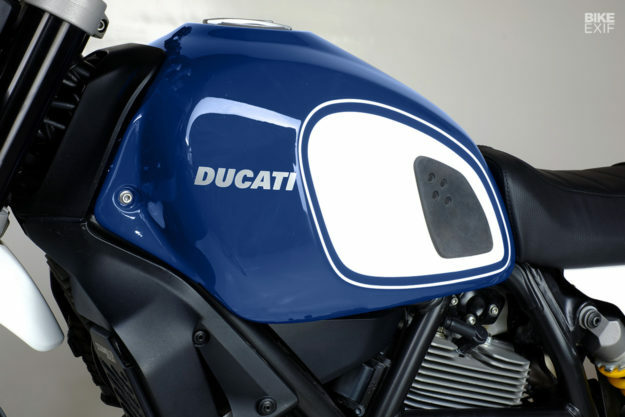 The original idea came from Italian motojournalist Roberto Ungaro, formerly of the Italian magazine Riders. 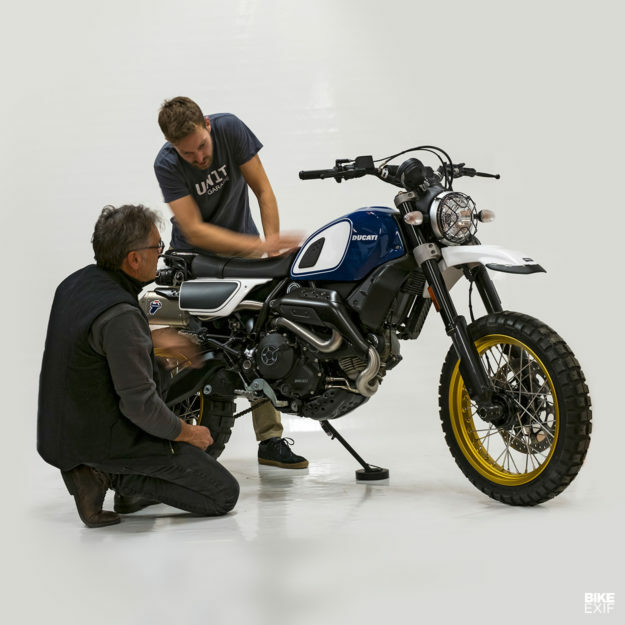 He suggested that Unit Garage developed a bike based on the Desert Sled—but Fabio decided to take the project a step further. Instead of building a one-off, he proposed an easy-to-assemble kit that could go into production, and lift the off-road capabilities of the Ducati to new heights. Termignoni agreed to produce a new exhaust, and the project was green-lighted. For this hand-made prototype tank, Unit Garage used steel. They’ve kept the lower part of the original tank, so it uses the same mounting points and fits the standard fuel pump. But despite being shorter, it holds two or three liters more fuel than the OEM tank. And since it’s a replacement tank, it uses the same plastic on the front section and the same fuel cap. The new seat is divided into two parts, and has a dual purpose. It can be used for two-up touring, because there’s a cushion inside the rear section. But the cushion can also be removed if you’re traveling alone, releasing a little extra space for small essentials. The planned kit will also include a side bag, with a quick release system and a dedicated subframe. 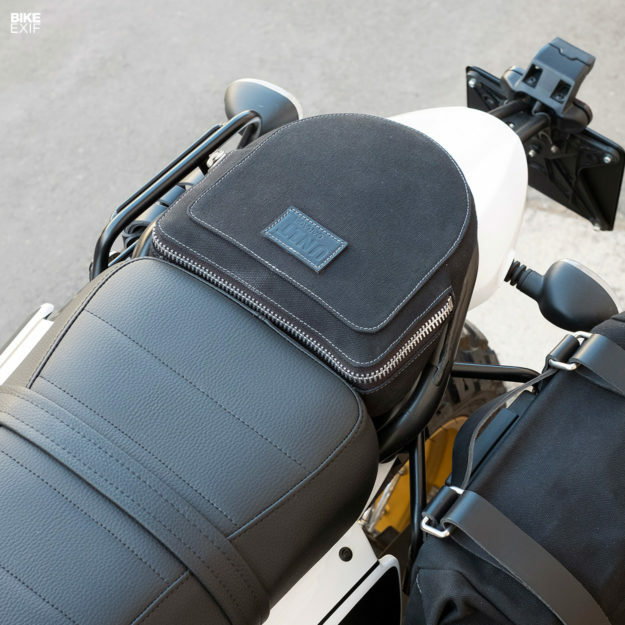 This will fit all Ducati Scrambler models, and uses an existing canvas bag from the Unit Garage range. There’s also a small toolbox that can fit under the swingarm, close to the engine. 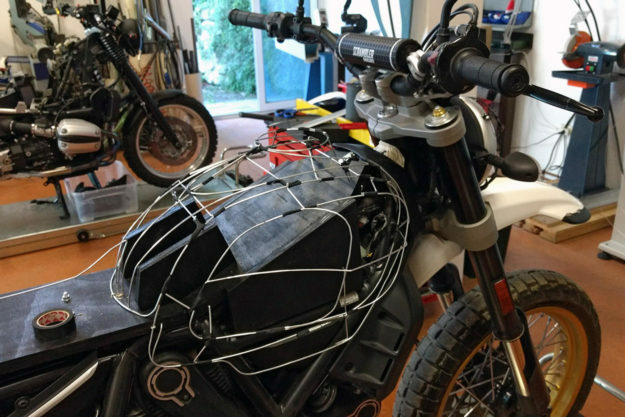 Fabio designed a similar system for his 1990 Paris-Dakar bike, and it’s big enough to contain a small repair kit to fix broken chains and punctured tires. A tough new aluminum bash plate protects the engine. 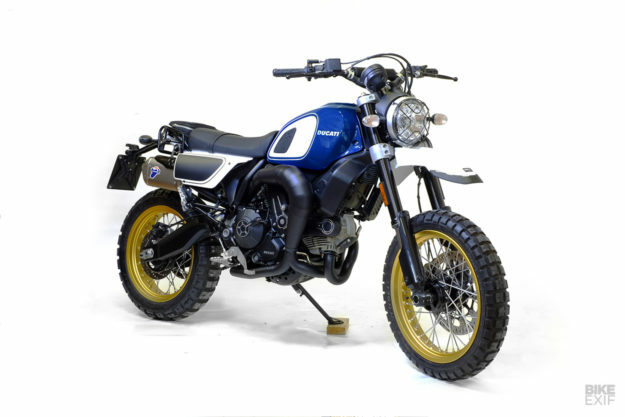 For such a practical machine, Unit Garage’s Scrambler looks exceptionally good. 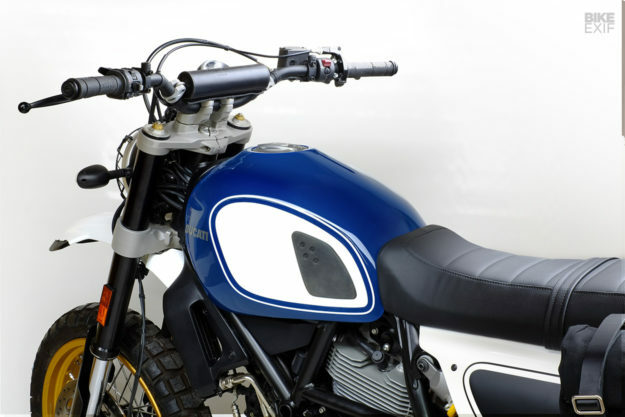 The lines, color and aluminum side panels echo what Fabio calls the regolarità (enduro) motorcycles of the 1970s and 1980s. 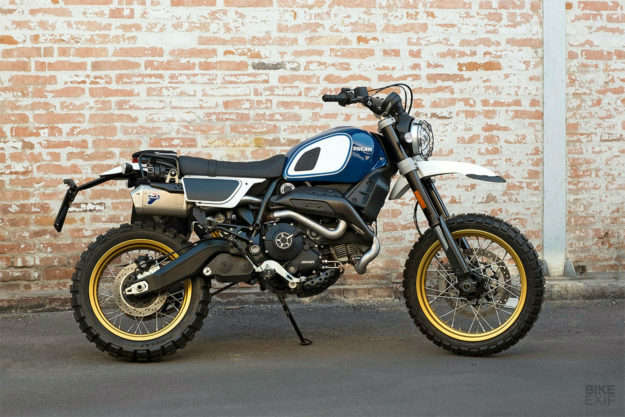 It’s worth noting that this kit will fit all models of Ducati Scrambler, not just the Desert Sled. So let’s do a little market research here: who reckons Unit Garage (or even Ducati) should put this one into production?